For a while now, I’ve been wanting a pair of headphones that automatically pause your music when you remove them. I’d been dreaming up complicated ways to do this, but my friend Kyle reminded me that it is easy and I should just do it. So, I put together a quickie project to do just so! 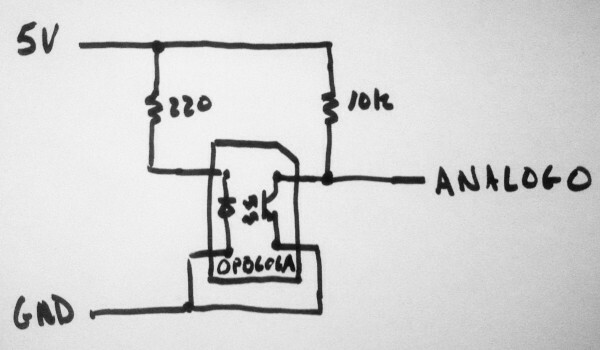 It’s based on an OPTEK OPB606A distance sensor that I got from Jameco, which puts out a low voltage when an object is near it, and a high voltage when all is clear. I whipped together a really sketchy arduino+processing script to allow the sensor to turn the music on and off, and voilà, it’s done! Well, almost. I left my headphones at work, so it will be more done tomorrow evening after I affix the sensor to them. But for now, you can whet your appetite on the circuit diagram aforementioned sketchy code, which are available after the break. // Return true if the headphones were just taken off or put back on. // is near it, so the headphones must not be on your head. // Run the Banshee music program with the play command specified. // If banshee was already running, it starts up the music again. // Run the Banshee music program with the pause command specified. // If banshee was already running, it just pauses the music. This is a really great idea! I could have used a pair of phones like this in college. Thanks Greg! I’m finding them to be useful at work, too. If it was patentable, it’s likely too late, as it’s been more than 1 year after the date of the article.